By the time you read this, thousands of happy fans will have already picked up their pre-ordered copies of Halo 3, the most hotly anticipated video game release of the year. No doubt most of them will have started playing too. The third and final installment in the successful Halo franchise, Halo 3 is in a lot of ways more than just another video game. It has become a de facto entertainment brand, complete with books, comics, action figures, and more. Additionally, Halo 3 has become an important marketing vehicle for Microsoft and its partners. In this post we take a look at the relationship between Halo 3 and Microsoft’s overall digital media strategy. Bungie Studios released the first Halo game, Halo: Combat Evolved, in 2001 for the original Xbox console. Considered the platform’s “killer application”, Halo centered around Master Chief, a human super-soldier doing battle against the alien Covenant. Halo 2, released in 2004, continued the storyline from the original and added new maps, weapons, and vehicles. It also ended in a cliffhanger, which some players felt was too abrupt. Halo 3 picks up where the previous game left off, and promises to bring closure to the story arcs started in the earlier games. It is also the first game in the series designed specifically for the Xbox 360 console. The Halo series of video games has already been incredibly successful, with Halo 2 breaking all kinds of records. In the first 24 hours after being released, 2.4 million copies were sold generating $125 million in revenue, surpassing Pirates of the Caribbean: Dead Man’s Chest which at the time held the record for a media release. The game has since gone on to sell millions of more copies, with players spending more than 5 billion hours playing the game on Xbox Live. The current champion of media releases is Spider-Man 3, which took in $151 million during its three-day opening weekend back in May, and Microsoft fully expects Halo 3 to surpass that number. The company has been happily calling Halo 3 the “biggest entertainment event of the year” for months. Of course, Spider-Man 3 will likely earn far more money during its lifetime when all ticket sales, television and video-on-demand rights, DVD rentals and sales, and licensed merchandise revenues are taken into account, but as the Los Angeles Times points out, Halo 3 will probably be far more profitable. Games like Halo 3 cost millions of dollars to create, but it’s still a drop in the bucket when compared to the budget of a blockbuster like Spider-Man 3. Halo 3 contains two new features in particular that are quite interesting, even if you’re not a gamer. The first, called Saved Films, allows players to save a copy of a game play to their console’s hard drive so that it can be reviewed later on. Lots of games, especially in the sports genre, have a similar feature, but Halo 3 is the first console game to really implement it well. Interestingly, Saved Films are not video files but instead contain the actual game data. This enables users to replay the game at any resolution, and to change things like camera angles. Saved Films might seem like a minor feature at first, but I think it’s really important for two reasons. Number one, it allows players to create clips and screenshots that can be shared with other players, effectively enabling mashups and remixes of Halo 3. Number two, it’s the first step toward allowing players to script their own storylines and movies. There’s talk that a traditional, blockbuster-style Halo movie is in the works, but I think fan-created Halo 3 movies would be so much better. The second feature is File Sharing. With this feature, players can store Saved Films, screenshots, and custom game objects on Bungie’s servers. The service comes in two flavors — free, which is limited to 6 slots and 25 MB of storage, and pro, which can be purchased for 750 Microsoft Points to increase the number of slots to 24 and the amount of storage space to 250 MB. File Sharing is important because not only does it support the Saved Films feature, it opens up a new revenue stream for the game. More importantly, if File Sharing is successful and well-liked by players, it could open the door to many more add-on services, not just for Halo 3 but for other Xbox Live enabled games too. It may also lend some legitimacy to Microsoft’s other cloud infrastructure initiatives, such as Windows Live Skydrive. Microsoft will definitely make money directly from Halo 3 sales, but they are also counting on the game to boost sales of other products. First and foremost is the Xbox 360 console itself. Halo 3 may not have graphics quite as sophisticated as Gears of War or Bioshock, but it is still considered the must-have game for the Xbox 360. 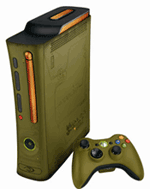 While that alone should lead to more sales of the console, Microsoft also decided to launch a Halo 3 Special Edition of the Xbox 360. The special edition includes the Halo themed console, and a matching wireless controller, 20 GB hard drive, and wired headset. You’ve still got to purchase Halo 3 on top of that. Similarly, Microsoft launched a Halo 3 Special Edition of the Zune. The special edition Zune sports a distinct Halo look and comes packed with artwork, music, trailers, and other video from all three Halo games. The Zune needs all the help it can get, so riding the Halo 3 wave is as good a strategy as any. The Zune is an important piece in Microsoft’s media strategy, but the platform needs a kickstart. The Halo 3 special edition won’t change the Zunes fortunes by itself, but it could lead to other marketing initiatives that help Microsoft turn the corner. Xbox Live also stands to benefit from Halo 3. Until it was overtaken by Gears of War last year, Halo 2 was easily the most popular game on Xbox Live and Halo 3 should reclaim that position. Multiplayer support in Halo 3 has been improved too, with a redesigned user interface and new features like the ability to advertise a public game. For gamers who have so far held out and avoided purchasing an Xbox Live subscription, Halo 3 might be the game that gives them that little nudge. More people with Xbox Live means a large audience for Microsoft to sell television shows and movies to. Another product that has benefited from the buzz surrounding Halo 3 is Silverlight, Microsoft’s platform for building rich Internet applications. Like Flash, Java, and many other platforms, Silverlight requires users to install a browser plug-in before they can use it. This presents a common problem — you need users to have the plug-in before developers jump on board, and you need developers on board building great apps for the platform before users want to install the plug-in. Microsoft decided to leverage Halo 3 to help solve this problem. Over the last few weeks, lots of Halo 3 related content has been made available such as trailers, promos, and an online manual. The catch? You’ve got to have Silverlight installed before you can view any of the content. It’s a very smart move. I’d be willing to bet that a lot of the early installs of Silverlight can be attributed to fans eager for Halo 3 content. Microsoft’s partners have gotten in on the action too. Mountain Dew launched “Mountain Dew Game Fuel” on August 13th, the first beverage co-branded with a video game. 7-Eleven has been offering three Halo 3-branded Slurpee cups, and has been part of the promotional campaign being run with Mountain Dew and Doritos. Burger King started offering Halo 3-themed packaging yesterday, and will continue to do so right through October 22nd. Other companies that are participating in the Halo 3 campaign include Pontiac and Comcast. In the battle for the digital living room, every advantage helps. For Microsoft, the Halo franchise has been extremely important in helping to establish the Xbox as a gaming and media platform. With Halo 3, the company has experimented with extending the marketing benefits to other products too, such as Zune and Silverlight. It remains to be see just what kind of an impact, if any, that experiment has had. If you’re a fan of the Halo games, have fun “finishing the fight” and don’t forget that you have to sleep sometime. If you’re not into Halo, be prepared to hear lots about it for the next few weeks! Excellent analysis, especially the point about Silverlight. If there’s one thing Microsoft knows how to do well its using it’s monopoly to push its other products. hey halo 3 is pretty good…are you guys going to play it? oh and today is National Play Halo 3 day!!! !